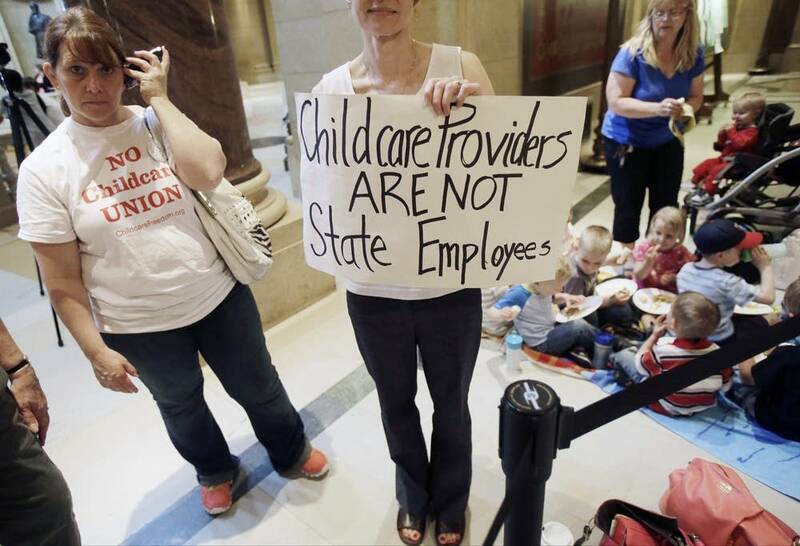 Warning that their freedom is at stake, Minnesota child care providers on Thursday asked a judge to stop efforts to unionize child care workers until two federal lawsuits against the state are decided. The legal actions stem from a new law DFL Gov. Mark Dayton signed earlier this year allowing subsidized child care providers to vote on whether they want to join a union and bargain collectively with the state. U.S. District Court Judge Michael Davis heard from two provider groups claiming the measure violates federal labor law and would result in forced union membership. An injunction or temporary restraining order is needed to prevent "irreparable harm" to providers, said Doug Seaton, a lawyer representing the first group. The law, he warned, would force private-sector employers to become quasi-public employees overnight. "A union election could take place within a matter of weeks," he told reporters later. "We think that's a serious matter." Representing the state, Solicitor General Alan Gilbert dismissed the concerns, saying potential harm couldn't be known and that the law requires a series of steps in the union organization process that would first need to be successfully completed. Lisa Thompson, a pro-union child care provider and AFSCME organizer from St. Paul, said afterward that she believes an injunction would harm providers who want a union. "We've been working for a long time to be able to join together to fix some of the problems in this industry, and to fix some of the problems with the subsidy program. Individually we haven't been able to do that. We need to join together collectively to solve some these problems, stabilize our industry and make family child viable forever." But Terrie Boyd, a child care provider from Detroit Lakes and a plaintiff in one case, said she would stop accepting children covered under the state Child Care Assistance Program if the law stands. She doesn't want to join a union or pay union dues. "I don't need to be offering a hand up to someone while someone else has a hand in my back pocket, taking the money back out." The other provider group suing the state is using a different legal argument to try to stop the unionization law. William Messenger, a lawyer with the National Right to Work Legal Defense Foundation, said the law infringes on his clients' First Amendment right of free association. "What the state's trying to do here is compel family child care providers to associate with an exclusive representative for purposes of lobbying the state," Messenger said. "In effect the state is trying to appoint a mandatory lobbyist and that compels association and that's unconstitutional." AFSME Council 5 spokeswoman Jennifer Munt told reporters that she believes both lawsuits are frivolous attempts by anti-union forces to score political points. She also rejected the claim by opponents that a union election is imminent. "There are 12,700 in-home child care providers who could vote on a union. It's going to take us some time to meet with each and every one of them individually at their homes. This won't happen any time soon." Davis took the motions in both cases under advisement. He said he would make his decisions known as quickly as possible.